This past weekend I was luck enough to get to attend The Horn Book at Simmons Colloquium. I had hoped to make it to Boston for the Boston Globe-Horn Book awards ceremony on Friday evening, however, the weather didn't cooperate. The colloquium more than made up for missing the awards though. The overarching theme for the day was collaboration. Each panel and presenter spoke about a different type of collaboration with regards to writing and publishing. The day started with a discussion about editorial partnerships with Rebecca Stead (author of the Newbery Award for When You Reach Me) and her editor Wendy Lamb. They talked about how they worked together to publish both When You Reach Me and Rebecca's first novel, First Light. 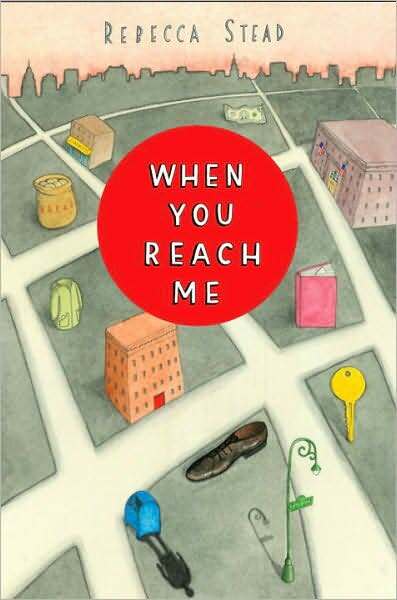 An interesting tidbit was that When You Reach Me's original title was You Are Here and after the cover art had been designed they learned that another YA book with the same title was being published around the same time. So after much debate and trying to get the other publishing house to change the name of their book, When You Reach Me was chosen as the new name. 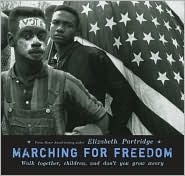 The second presentation was by Elizabeth Partridge, author of Marching for Freedom. She talked about about collaborating with the photographer. And the main part of her talk was about Google Lit Trips. Google Lit Trips describes itself as "a different way to read great literature." It uses Google Earth to take the viewer on the same trip characters in a book took. Ms Partridge took us through part of the Lit Trip for Marching for Freedom, and it was very cool to see how the whole thing works. It flies you into the town or area where the book is set and you can click on different area and information boxes pop up, they include everything from info about the town, historical facts, videos and more. You have to download Google Earth to go on any of the trips, but the website itself has a lot of information. After lunch there was an awesome "Discussing Picturebooks" panel that included Helen Oxenbury, John Burningham, Laurel Croza, Matt James and Peter Sis and was moderated by Roger Sutton. This was the most fun panel by far! They mostly talked about the collaboration between the author and illustrator. How most of the time the author and illustrator don't meet, so all the illustrator has is the text. There was also some discussion about voice and how the whole voice of a book can be changed by the illustrations. I sat through most of the discussion just in awe of the fact that I was in the same room as Helen Oxenbury, John Burningham, and Peter Sis. The final presentation of the day was by Megan Whalen Turner and her editor Virginia Duncan. 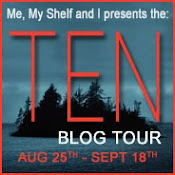 Now, we all know what a huge fan I am of MWT's Queen's Thief books, so this was very exciting! They had a great presentation about book covers. Usually, authors have very little input on covers and Ms Turner said that she usually leaves what happens on the outside of the book to the designers and as long as the cover is a pretty picture she's happy. However, with A Conspiracy of Kings there was a bit of a kerfuffle. The cover when through quite a few changes, including the addition and removal of facial hair, the addition of a manacle and a ring. In fact, because the editors wanted a ring on the cover, Ms Turner actually wrote a ring into the story! It was fun to see the changes in the cover and how it evolved from a super stark cover to the beautiful final cover. There were some break out sessions as well, where we got to choose which sessions we attended. I went to a storytelling session, which gave me lots of story time ideas, and a booktalking session which was fun because I love to see other people booktalk. The presenter was so excited about all of the books, she was literally bouncing around the room! I didn't get any pictures...I wasn't sure if we were allowed to take pictures. But Roger Sutton has some great pictures on his blog. Congrats on meeting MWT in person! :) I can just imagine how excited you must have been. 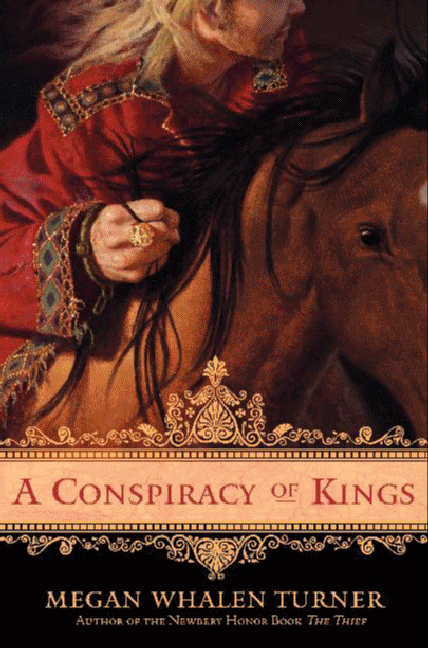 It's interesting to know that the cover for A Conspiracy of Kings went through so many changes.